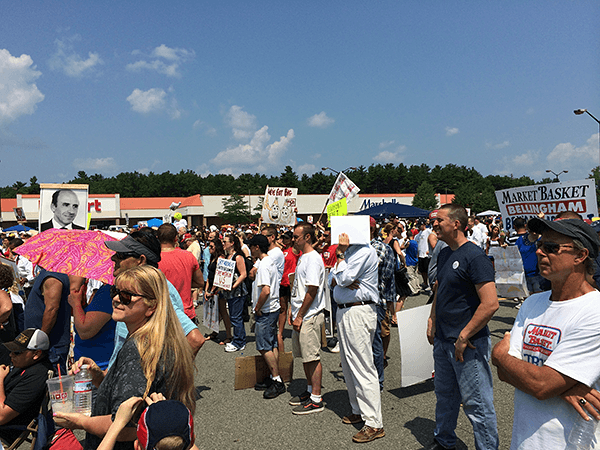 As many as 5,000 to 6,000 Market Basket employees, customers and supporters gathered at Market Basket headquarters in Tewksbury, Mass. Tuesday, according to police on the scene. 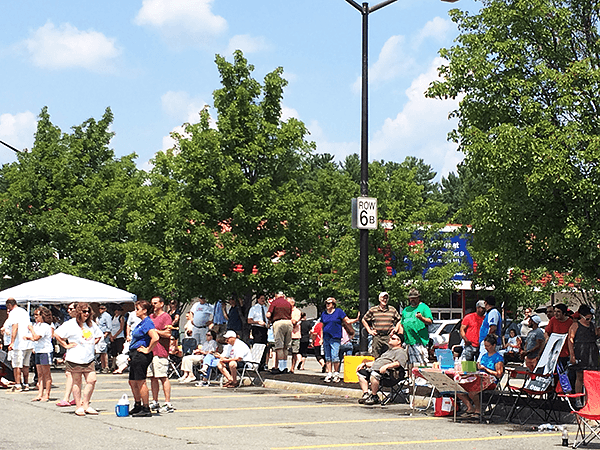 The Market Basket rally began at 11 AM, with parking already at capacity and late-arriving supporters taking shuttles and busses from parking lots further away. Steve Paulenka, a former Market Basket employee who was fired for his role in organizing the first employee rally, acted as emcee for today’s gathering, introducing current and former Market Basket employees who shared their stories. 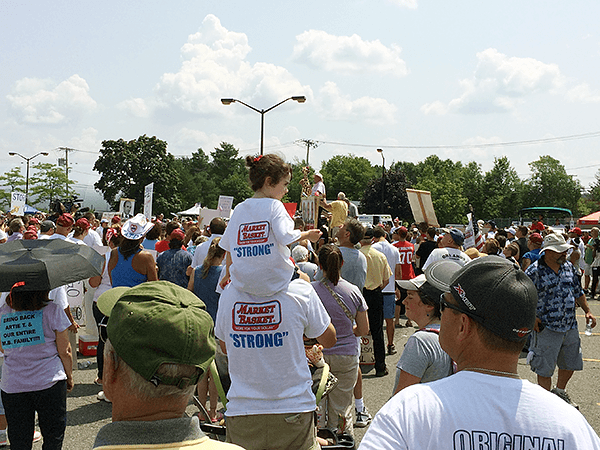 Employees and customers traveled from around the New England region to show their support, some as far as Londonderry, New Hampshire. 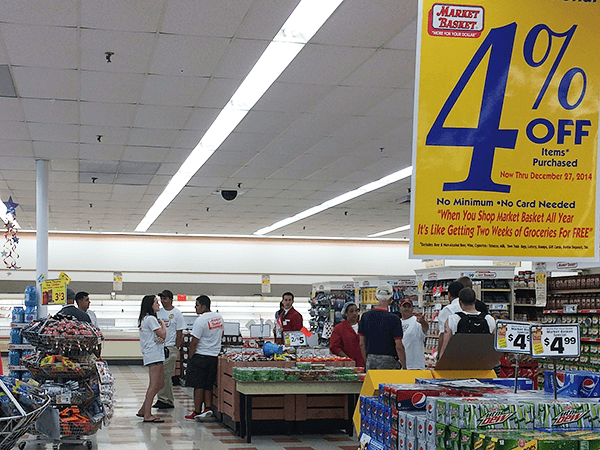 Many gathered in groups wearing t-shirts and holding signs proudly displaying their store numbers. Below are scenes I captured from Tuesday’s rally. 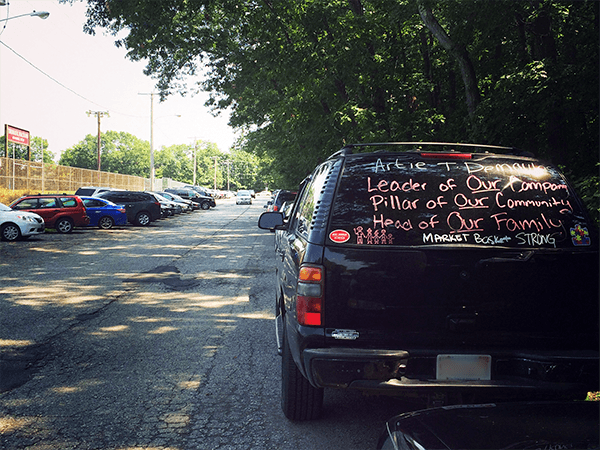 Cars lined parking areas as far as a half-mile and more away from the Tewksbury Market Basket store. Rally organizers provided shuttles from the farthest reaches of parking. 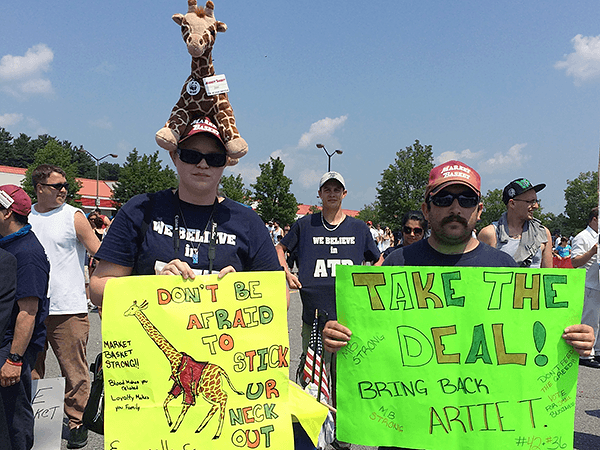 Nearly 6,000 supporters stood out in near 90-degree temperatures to demand the reinstatement of ousted former CEO Arthur T. Demoulas. Rally supporters sought out shade wherever they could find it. 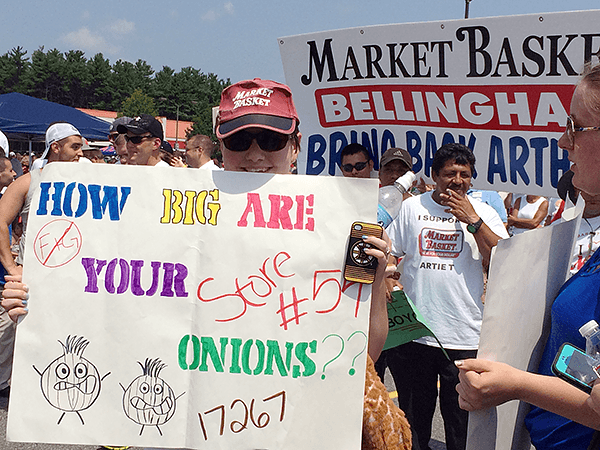 Market Basket employees proudly displayed their store numbers – and their clever signs of support. 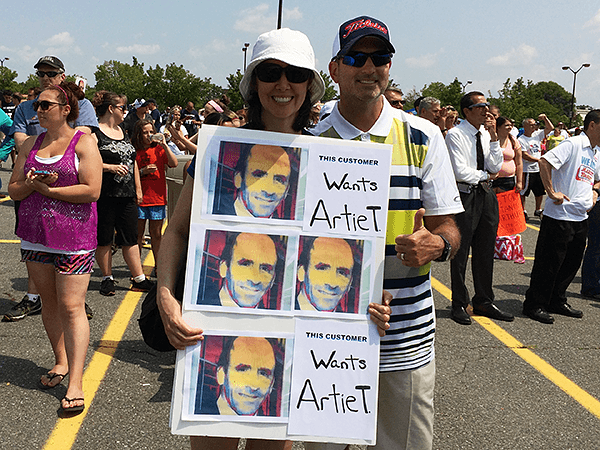 There were just as many Market Basket customers in attendance as there were employees, ready to stand by Artie T.
Crowds gathered to hear Steven Paulenka, an operations manager fired for his role in organizing the first Market Basket rally. 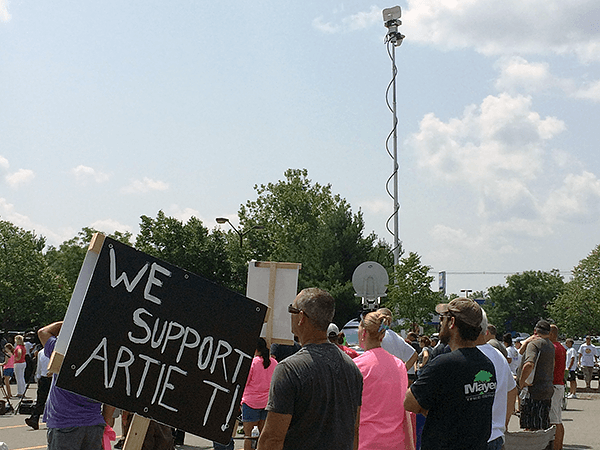 Tuesday’s rally and ongoing store protests have attracted local and national media attention, as seen by the several news vans and satellites camped around the rally perimeter. 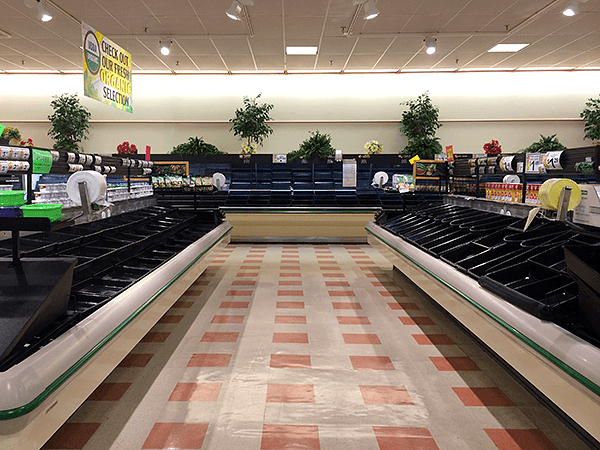 The Tewksbury Market Basket was a virtual ghost town on Tuesday, as it has been for over a week now since the customer boycott began. 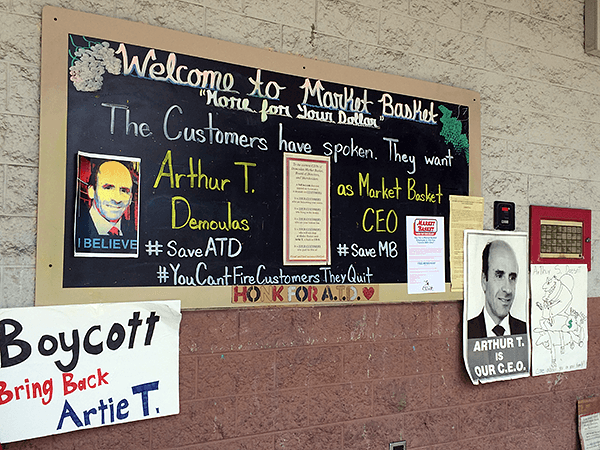 Signs showing employee support of ousted former CEO Arthur T. Demoulas are plastered all over the front of the Tewksbury store. 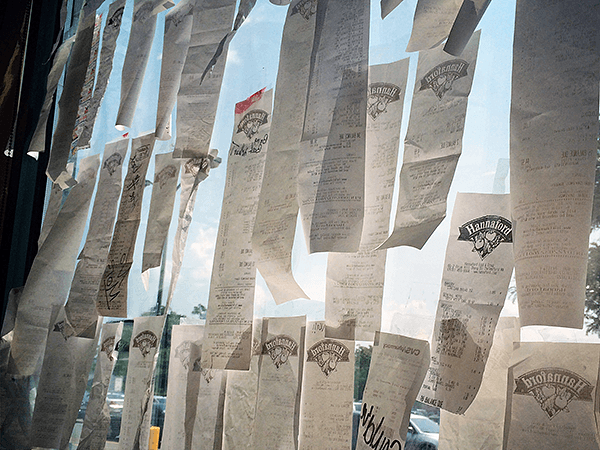 Hundreds of receipts from competing supermarkets cover the store front windows of the Tewksbury Market Basket store, as customers show their support of the boycott. 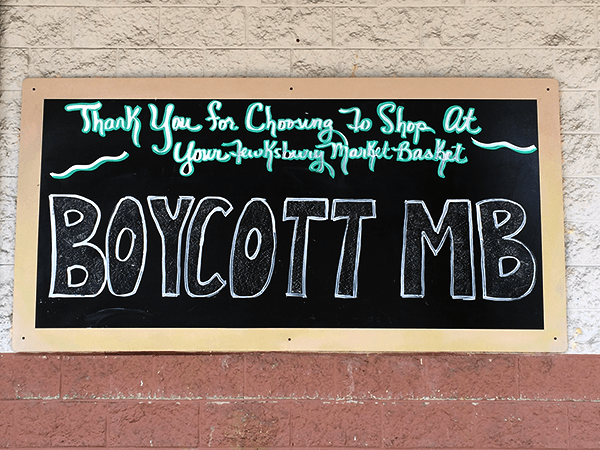 According to speakers at Tuesday’s rally, Market Basket sales have been down 90% since the customer boycott began over a week ago. 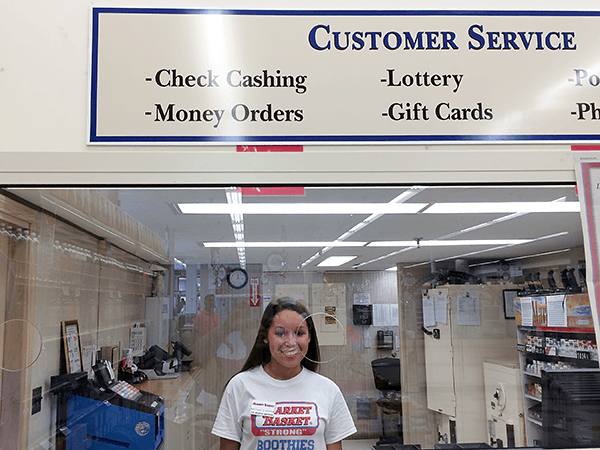 A Market Basket “boothie” (an associate who works in the Customer Service booth) shows her support for the rally with a t-shirt since she can’t join them while she’s working. 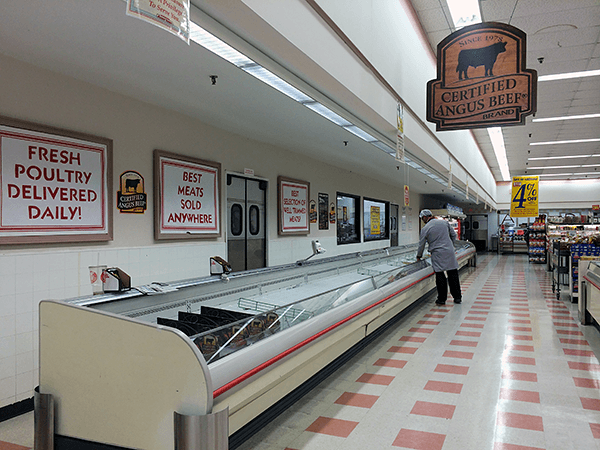 With no deliveries in over two weeks since drivers walked out in protest, there’s little for this Market Basket butcher to do in his empty meat section. The produce section was one of the first sections of the store to have bare shelves. 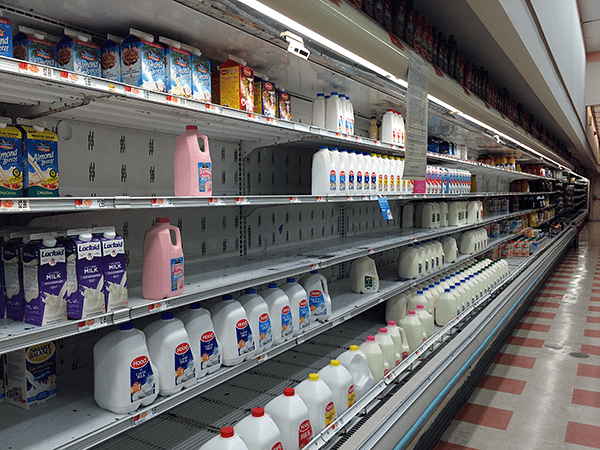 Supplies dwindle in the dairy aisle. Without deliveries, it won’t be long before these shelves too, will be bare. 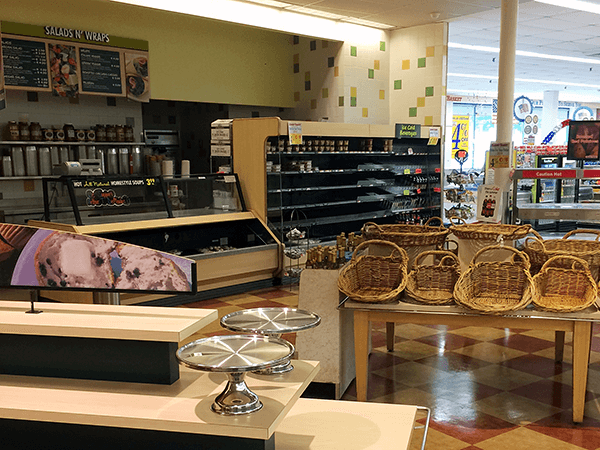 The bakery section stands bare. 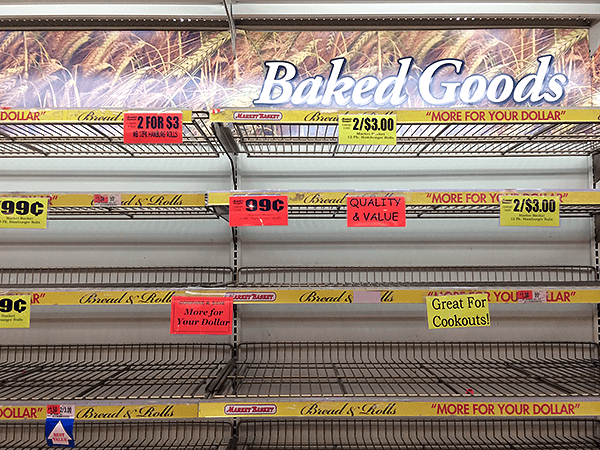 Sale signs promising “Quality & Value” and “More for Your Dollar” line empty shelves in the baked goods section of the Tewksbury Market Basket. 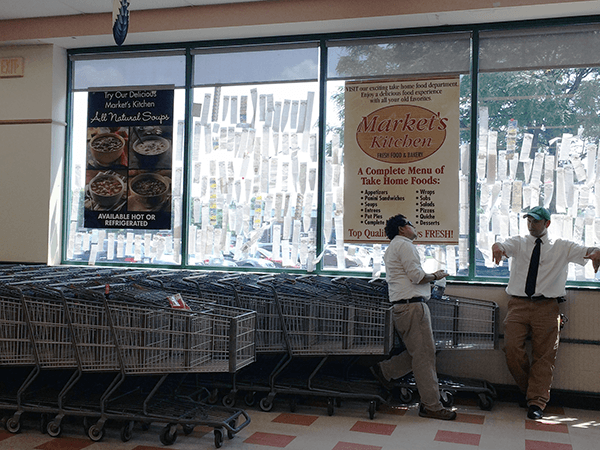 With no customers to patron the Tewksbury store, Market Basket employees do what they can to stay busy and keep their store in shape. 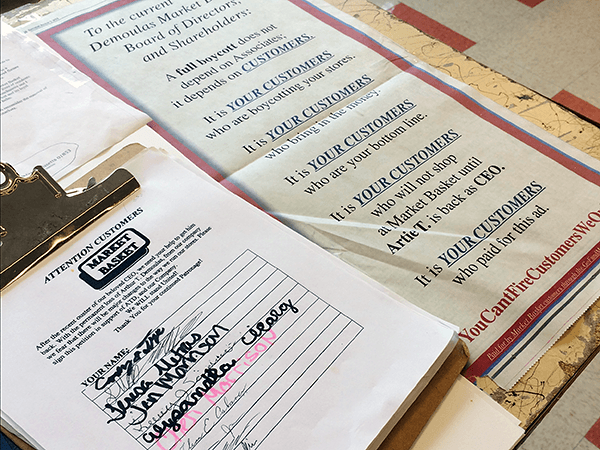 Market Basket employees encourage customers who do come in to sign their petitions; a copy of the customer-funded counter ad appears next to clipboards. 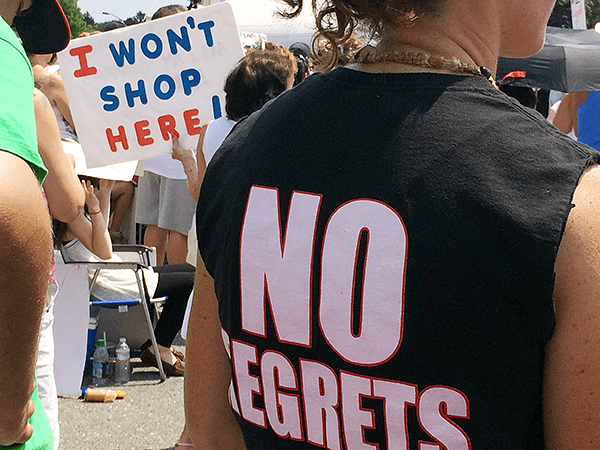 As store protests and rallies enter their third week, co-CEOs James Gooch and Felicia Thornton have refused to back down on their hardline stance against current Market Basket employees. Today marks the second day of job fairs advertised as an ultimatum last week by Market Basket execs. Turnouts at the job fairs have been marginal at best, given that most job applicants are hesitant to cross picket lines at the job fair sites. 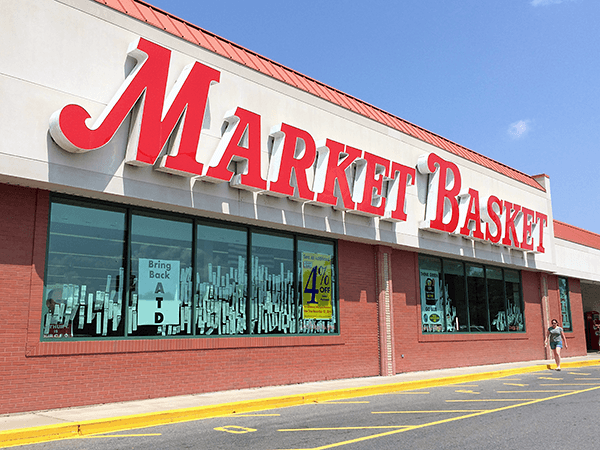 With no immediate end in sight to the standoff between Market Basket execs and employees, stay tuned here for continuing updates to this story. Keiko Zoll is a mom, writer, geek, women's health advocate and all-around sassypants. She writes for Disney Baby and Answers.com. You can find her all over the social web, usually Instagramming and Pinning into the wee hours of the morning.